The 2016 Magic Marine Southern Championship was hosted by Lymington Town Sailing Club 18/19 July 16. Although not originally planned as a RS700 event it became apparent that there was growing / rejuvenating home fleet that were keen to join the rest of the RS Classes at this huge showcase event (160 boats in total!). 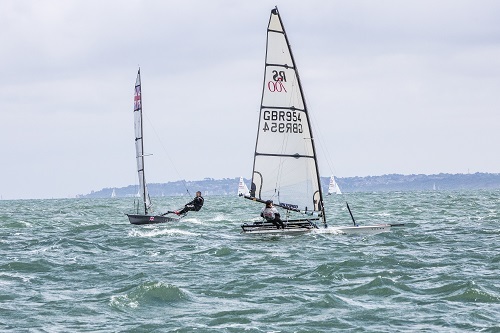 With RS700 competitors travelling from as far away as Snettisham Beach it was clear that there would be some competitive sailing… or they were just attracted by the legendary LTSC social! Day 1 – With all competitors arrived in good time there was plenty of time to enjoy a leisurely rigging session in the boat park, while catching up with some familiar faces. With the slower RS fleets launched first, the RS700 sailors watched them from the balcony as they drifted down the river on the ebb tide. It was clear from the outset that the forecast was looking correct and we would be spending most of the day in light conditions! 30 minutes later RS700 fleet were launched with the RS500’s and RS800’s, and headed for Course B - just to the north of the river entrance. As we neared the race course the wind picked up to an encouraging 8-10kts; this was a great relief as there was a ripping tidal current to contend with. Race 1 – The RS700’s were the first fleet to start with the competitors struggling to keep the right side of the line in the tide. The start sequence caught a couple of sailors out who were still bimbling down towards the start line. Ed Reeves made a clean get away with fellow locals Richard Lilley and Richard Keeton in close pursuit. Throughout the race Ed maintained his lead, but Richard Wadsworth closed in on Richard L – exchanging positions a number of times as they vowed for 2nd place. On the last downwind leg, the wind began to die and swung more northerly. Richard W gybed off early and arrived directly on the new lay line where he rounded the leeward mark on the transom of Ed. With the pair unsuccessfully trying to hold their kites to the finish, it was a scramble to drop the kites and reach for the line – with Ed taking the honours. Race 2 – Got underway in a marginal but sailable light wind. With a few well-placed tacks Richard W delivered his svelte frame to the windward mark first and began pulling away from the chasing pack… at this point the wind completely died and the race was abandoned. 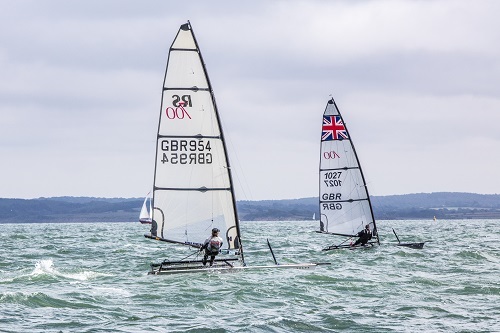 Race 2 Mk 2 – After about an hour of taking in the scenery and enjoying the day, the wind filled in from the north-west and the race got underway again. Richard W again made good speed to the windward mark and continued to extend a sizeable lead throughout the race with Colin Dacey bringing in a comfortable second place ahead of Ed. Richard W will be exchanging the secrets of his light wind rig settings for beers at the pre-Nationals Training Session! 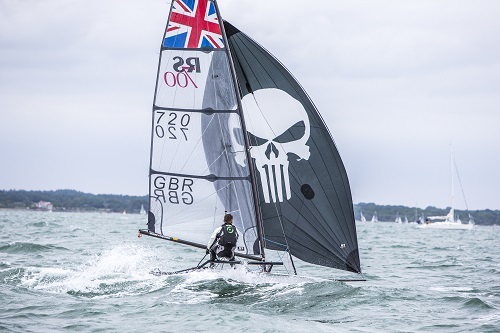 Day 2 – Although not as sunny as the previous morning, the wind was looking much more favourable as the competitors headed out to the race-course, with some sailors beginning to wish they’d dressed more appropriately (me!). Unfortunately the Fleet lost 2 sailors before the start of the first race; Richard Lilley ‘fell in action’ on the dance-floor during the Saturday night social and Ed broke something ‘boat related’ on the way out to the racecourse. Race 1 – The first race got underway in a solid F4 with all sailors enjoying ‘powered up’ rigs and able to foot off. Ian Nolan and Colin came into their own in these conditions to lead Richard W around the windward mark. Ian, Colin and Richard W were close formation for the whole race with Ian and Colin regularly exchanging the lead, however, on the final downwind leg, Richard W stole the advantage by gybing off ‘early’ to hit the layline and overtake the Snettisham boys. With a race to the line, Richard W took the honours with Ian in second and Colin a close third. 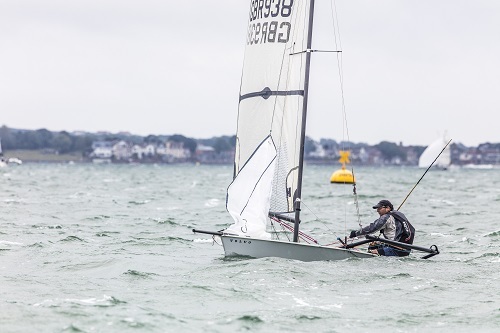 Race 2 – The wind and challenging sea state continued to build as the second race got underway with all competitors swinging off their downhauls to shed power upwind. Ian Nolan again showed great pace up the first beat with Richard W on his tail around the windward mark. After a tentative wobbly mark rounding through the waves, Ian and Richard were confronted by a 45ft yacht in their way being shouted at by the safety boat. With the yacht trying to manoeuvre erratically out of the way Richard W dipped behind and Ian shot across the bows of the confused day trippers! Richard W hoisted the kite and got on the power first to take the lead. This was to be short lived though as he went for a swim on the next leg whilst trying to find his illusive footstrap (GoPro footage to follow!). Ian had a lonely race for the remainder of the race until Richard W caught back up at the last mark…albeit with Richard W heading in the wrong direction out of control with the kite up. Ian graciously avoided him to take his first win of the weekend, with Richard W coming in second and Colin taking third. 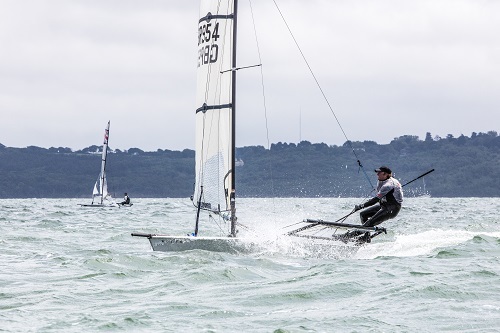 Race 3 – By the start of race 3 the weekend had taken its toll on the starting line up; Ed Reeves – boat breakage, Richard Lilley – freak dance floor injury, Spike Daniels – spinnaker dressed around forestay, Ian Nolan – old man cramp hands, Tig Williams – MIA. By the time the third race got underway, the conditions had built to ‘fresh to frightening’ and saw Richard W round the windward mark first. At this point the author is unable to add any commentary on the race - he was too busy hanging on for dear life with a permanent look of horror on his face as his boat made ungodly noises as it systematically took off and submerged through the mogul field of waves downwind. Richard W ‘hung on’ to take first place ahead of Matt Connor and Colin with a well-earned third place. With only Matt (let’s go again) Connor hanging around for a 4th race the race officer settled on it being a 5 race series. Overall, Richard Wadsworth (Stokes Bay SC) won 1st place, with Colin Dacey (Snettisham Beach SC) in 2nd place and Ian Nolan (Snettisham Beach SC) taking a credible 3rd place. A massive thank you to our sponsors Magic Marine, Volvo Cars and Harken. I look forward to seeing you all at the upcoming European Championship in Garda, 25-29 Jul 16, and National Championship at Hayling Island SC, 25-28 Aug 16.